Moving house is stressful. Most of you know that I've been living at my parents' house for just over a year no and I'm looking at my next place to call my own. Searching through estate agency websites is driving me insane so, to give me some light at the end of the tunnel, I've been dreaming of what my new interior design will be like in my new place (My poor old Pinterest account is exhausted), especially my bedroom. The bedroom is the most important place to feel snug and relaxing, so I think it's really important to create a unique, calming vibe in the room. I've put together my little (well, not so little...) wish list of home ware items I'm lusting over for my bedroom. To be honest, I love how my current bedroom looks but it is so tiny I can't fit anything in so hopefully the next one I can actually buy all of these beautiful items to decorate my dream room with! How awesome is this bed? I just love the fact that it has the little shelves behind the headboard... think of all the things you could out there! I'd definitely keep my phone there and probably lots of books. It also has under bed storage which is perfect for all my lovely bed linen I obsess over. Can you see a lust for storage ting going on here? Yep, I'm one of those obsessive hoarders so storage is perfect for me! And I hate the orange duvet covers that IKEA have put on so I'd go with these Belledorm 'Oyster' covers from The Yorkshire Linen Company instead. Bit of a cheat one this as I already have this wallpaper in my bedroom right now. I have the white version but I remember being torn between white and this baby blue one I've popped on my wish list. I adore this paper and I know that I will want it in my new bedroom when I move. It's a bit sad that I'd just use the same paper I have now but I honestly love it so much I'll be sad to leave it behind! Voile curtains are gorgeous. I know some people aren't fans but I just think they add an almost Princess feel to the bedroom whilst still looking quite grown-up and sophisticated. The Yorkshire Linen Company have so many types of voile curtains I was spoilt for choice but in the end I decided that I'd probably go for a nice, crisp, white shade for my bedroom. I was tempted by the Teal, because of the blue wall paper, and there are also some beautiful Nightingale print but maybe too many colours/patterns is overkill if I go with patterned wallpaper. Like I said, I like my bedroom to be super relaxing so dreamy, white, soft as clouds voile panels for me! Vintage style is right up my street and I just think this alarm clock is delightful. Whether I'd actually use it or not is a different matter however I think it would look so stylish on a little side table next to the bed. They come in a couple of colours too, all pastel, which could look great in any bedroom. I would have gone with white but the baby blue one was much nicer than the cream so that got the prestigious place on my wish list. Again, I have to confess, I already own this lamp. But this isn't cheating this time because I have the smaller version... this one is a little larger and would add much more light to my room than my current tiny lamp. I love IKEA lamps as they are stylish without going too over the top. The print is gorgeous and I love how the light shines softly through the frosted glass. Super relaxing. You know I love candles right? I do have a million and one candle/tea light holders but I really love the home ware from H&M and I had to include this beauty! Again, these tea light holders come in a variety of colours and they actually come in different shapes which is nice because you can get the perfect look for your room. Let's face it, tea lights are ugly but they give the room a lovely ambiance so why not dress them up in one of these holders? I think you get a good idea of how my next bedroom will look by now. I'm fond of the cool tones, blues and whites, and the nice, ambient feel for the room, with the tea light candles and voile panels, to make it super relaxing. How do you style your bedroom? 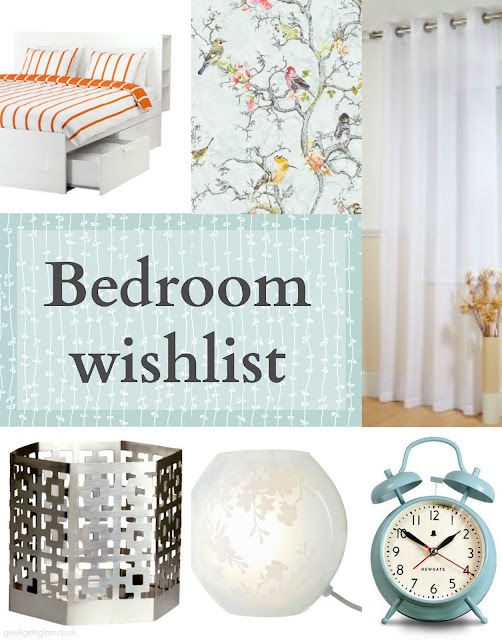 Which things from my wish list would you love in your room? I love that lamp. I keep meaning to pick it up when i go to IKEA but i always forget!